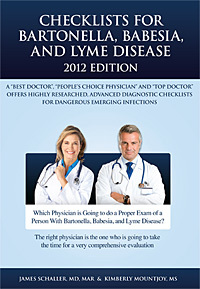 HERE IS A FULL HIGH QUALITY 2012 CHECKLIST TEXT FOR BARTONELLA, BABESIA AND LYME DISEASE ... IT IS DESTINED TO HELP PEOPLE THROUGHOUT THE WORLD, BECAUSE IT IS A HIGHLY DETAILED AND PRACTICAL COLLECTION OF DIAGNOSTIC INFORMATION. No text currently exists that is based on as much research, study and extensive evaluation of patients, who have seen over fifty physicians without successful diagnosis or treatment, and who appear to be infected with these three common and dangerous organisms. HAVE YOU BEEN SUFFERING from severe headaches, joint pain, depression, fatigue and weight gain just to name a few? HAVE YOU BEEN TO NUMEROUS TALENTED PHYSICIANS with no answers or clear diagnosis?? Is it possible you might have Bartonella, Babesia and/or Lyme disease? 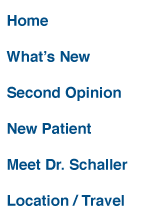 These highly expanded and thorough checklists are designed to prevent missing a positive infection. The research found in over 4,000 articles shows that missing one or more of these infections can result in severe headaches, heart death, poor memory, vision disease, strokes, seizures, arthritis, depression, insomnia, weight gain or loss, fatigue, body aches, brain fog, panic attacks, disability and many medical, psychiatric and/or neurological illnesses with no clear cause. This is a powerful and clear book meant to help you and your licenced healer get a diagnosis. The author's ultimate message is one of HOPE and a strong belief these illnesses can be CURED. The author does not claim to be smarter or more wise than other healers. His only claim is that he is working very diligently with people who are not getting better, even after seeing very talented physicians and other health care workers. He loves helping "treatment resistant" people from all over the world get their life back. Currently diagnosis, regardless of the laboratory used, is sub-optimal. Laboratory testing is not as predictable as math even if some labs have attempted to create improved and very sensitive tests. Many factors impact direct testing for infections like Bartonella, Babesia and Lyme disease. Therefore, testing with a single tube of blood sent to one location is no guarantee of perfect diagnosis. Even if testing is 90% accurate, which some dispute, what will happen over years to the one person missed who carries one or more tick and flea infections inside their blood and tissues? That is one reason this book discusses indirect testing in each checklist. The author's extensive reading shows that these infections do not merely have a few main symptoms. The research shows a wide range of signs and symptoms can exist with tick and flea-borne infections. The author is a "Best Doctor of America," an honor awarded to only 5% of physicians by physician peers, and a "People's Choice Award Doctor" according to patients. This is his seventh book on Tick and Flea-borne infections, and his work is based on FULL-TIME reading and study. He treats patients part-time. He is the author of 30 books and 27 journal articles that relate to over ten areas of non-surgical medicine.